Week in Review: April 5 - 11, 2019. Summary: Warm temperatures early in the period, with a strong Pacific storm system arriving on Wednesday. Friday April 5 - Warm temperatures led to the usual wet, loose activity. The largest slide was from Hellgate cliffs that left a small amount of debris on the Little Cottonwood road. Sunday April 7 - Clouds and cool temperatures kept the snowpack locked up, with no avalanches reported from the backcountry. Monday April 8 - Glide avalanche in Blue Ice area of Broads Fork - observation. A wet slide coming own from Kessler hit the skin track on the usual ascent up to Cardiff Fork - observation. Tuesday April 9 - Poor refreeze for the 2nd night in a row. 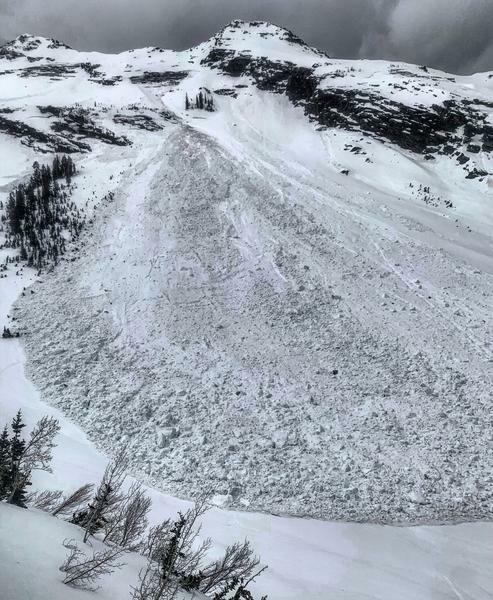 Large glide avalanches in Broads Fork - Mark White's observation can be found here. Wednesday April 10 - The winter that continued to give. A rain/snow line that initially goes to about 9000'. but drops as colder air and snow fills in. Storm totals include 12" Park City mountains, 1-2' in Big Cottonwood, and is often the case with a northwest flow, nearly 3' in upper Little Cottonwood. Avalanche activity aligned with snowfall, with upper LCC seeing the most activity, including large slides running on south-facing slide paths above the highway. In Kessler Slabs area on Kessler Peak, a rider was fortunately able to get off of a slide that ran nearly 1000' vertical. Also on Kessler, a party reported natural avalanches on the east-facing Catcher's Mitt - observation. A density inversion within the storm snow is also noticed, but many observers outside of upper LCC find the storm snow to be unresponsive to stability tests. Thursday April 11 - The cold (for April), unstable flow continues, with several additional inches of storm snow reported. 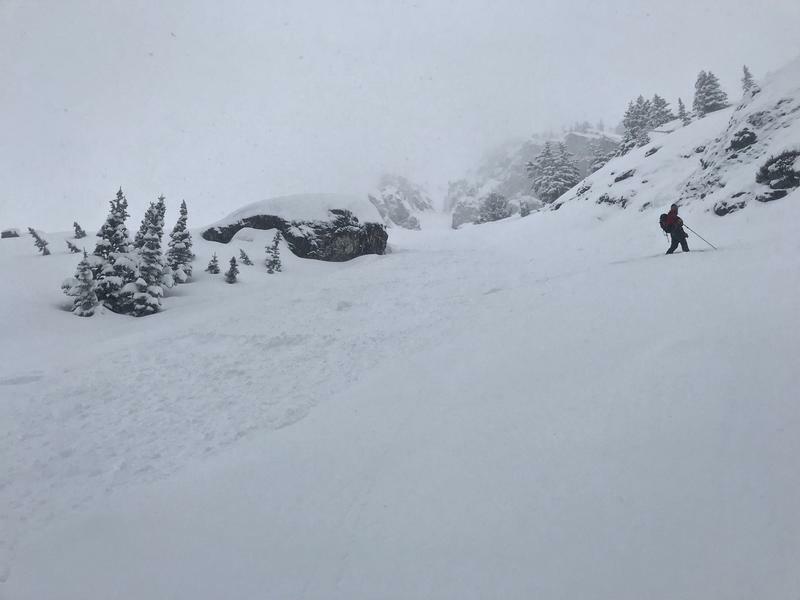 Upper Big Cottonwood reports 2' of storm snow since Wednesday, with upper Little Cottonwood reporting over 3', with nearly 4" of water weight. Most observations indicate instabilities within the storm snow to have largely settled out.